Details at the end of this post on how to enter to win an ebook copy of The Haunting of Dr. Bowen. We also have a link to order it from Amazon. Last year, I was propelled back in time to Fall River, Massachusetts, in the 1890s, where a famous ax-murder turns out to be self-defense because daddy and step-mommy attacked first, transformed into brain-seeking creatures in Verstraete’s Lizzie Borden, Zombie Hunter. By now, I was ready for anything from Verstraete…I thought. 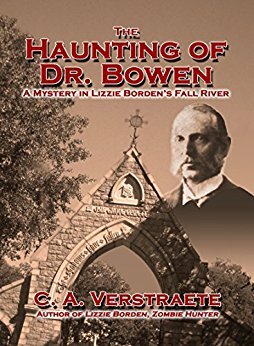 Then, along came a slim volume of fiction: The Haunting of Dr. Bowen: a mystery in Lizzie Borden’s Fall River. How was I to prepare myself for a partly paranormal mystery wrapped around a tender love story? Enter Dr. Seabury Bowen, the physician who first examined the grisly remains in the Borden household. More than a decade later, he’s retired and seeing visions of a dark-skinned man at the edge of his memories of the murder and the funeral. The town seems plagued by unusual violence. Compelled to investigate the woods that once was the home of native tribes, he stumbles upon a murder scene, but local law enforcement finds no corpse when he reports the crime. With no official power, he keeps trying to solve the case and get rid of his dark, silent visitor. Bowen suspects the mayor is involved; why else would the man be suddenly interested in being around him? The doctor lies to the town marshal, and fears that he might find himself arrested. Meanwhile, Verstraete treats us to scenes of gentle domesticity, as Bowen tries to express his concerns, and his wife comforts him and reassures him that he will find the answers to his questions. Each chapter begins with testimony from the trial that still haunts the old doctor. This novelette only runs 120 pages, but manages to fill them with mystery, paranormal dread, red herrings to mislead the reader, and that sweet touch of long-lasting love. Verstraete keeps the plot—and our minds—turning, as always. After all the darkness, it ends with a wistful smile. To enter to win an EBOOK copy of The Haunting of Dr. Bowen, simply email KRL at krlcontests@gmail[dot]com by replacing the [dot] with a period, and with the subject line “bowen,” or comment on this article. A winner will be chosen October 21, 2017. U.S. residents only. If entering via email please include your mailing address, and if via comment please include your email address. Terrance V. Mc Arthur is a Librarian for the Fresno County Public Library. This is intriguing, and I’d love to read it! Thanks for this chance! Great for any time of the year — love their adding Lizzie Borden to Halloween!